Oops, this post originally stated that the domains were five letter ones. They’re really six character dot coms. If you’re looking for a domain name with three, four or five letters and a dot com, you’re completely out of luck. There are none available. As far as six letter dot com domains go, though, it’s an entirely different story. Using only the twenty six letters of the alphabet, there are 308,915,776 of them. 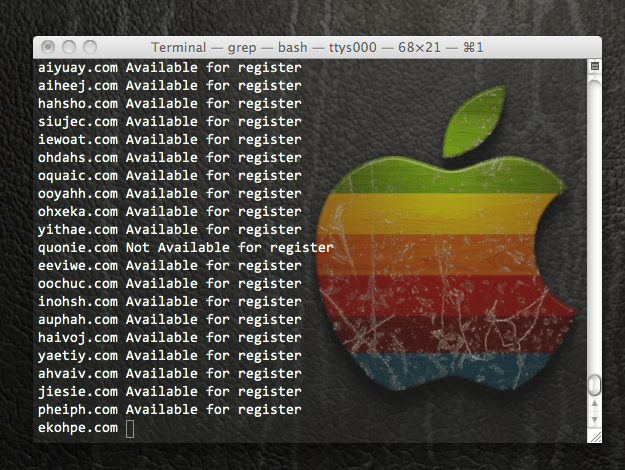 I hacked together a quick little script that randomly generated 10,000 six letter domain names and checked their availability. Of the 10,000 I checked, 9,296 of them were available! The (huge) list of the available ones and the shell script I found to generate and check the domains is after the jump. For more information on the script, leave a comment below. Can be downloaded here. Click on the domain the register it.